Many visitors ask us about how to start with Excel Dashboards. What should I read, where can I find free and paid resources for creating Dashboards? Actually there are just a view publishers for Excel Dashboard Training. Here you can find a review of their products. We tried and tested all products. So read what we find out in our reviews. 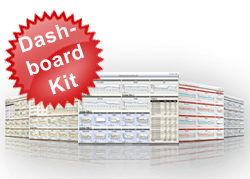 The Excel Dashboard Template Kit is one of the first books about Excel Dashboard Reporting. Charley Kyd the father of all Dashboard Reporting describes in his book how to create dashboards. Read our short review and watch the video. Learn how to create Dashboard Templates in Excel. In this short Video tutorial you will learn the creation process of an Excel Dashboard Template. The Tutorial starts with the basics of Dashboard construction and ends up with a final version of the dashboard you can see on left hand side. 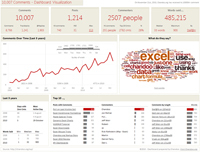 Read the review about the Excel Dashboard Course. Add-ins and Plug-ins help to extend standard Excel functionality. The tools will be integrated in your Excel Navigation or give you access to new formulas and functions. With these tools you can accomplish new extraordinary tasks.